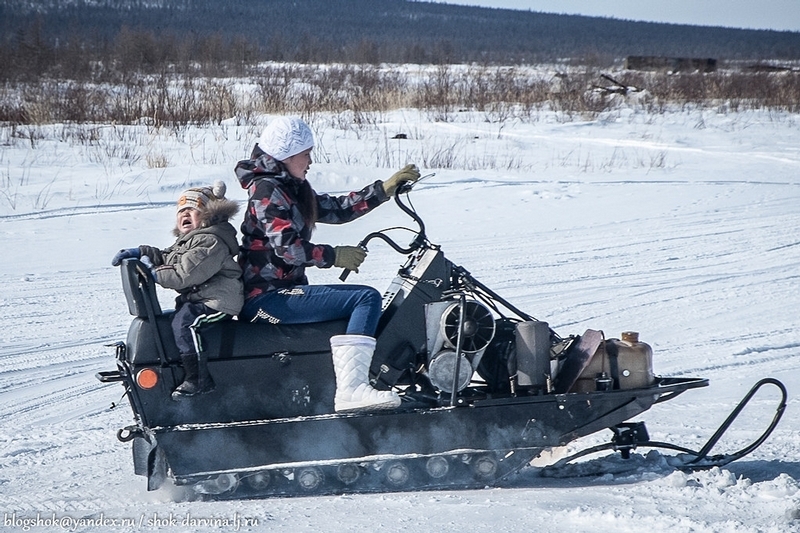 Essey is a village in Evenkia behind the Arctic circle, a beautiful place with amazing nature around, a nice lake Essey full of fish and sunny summer that lasts only two months a year though. 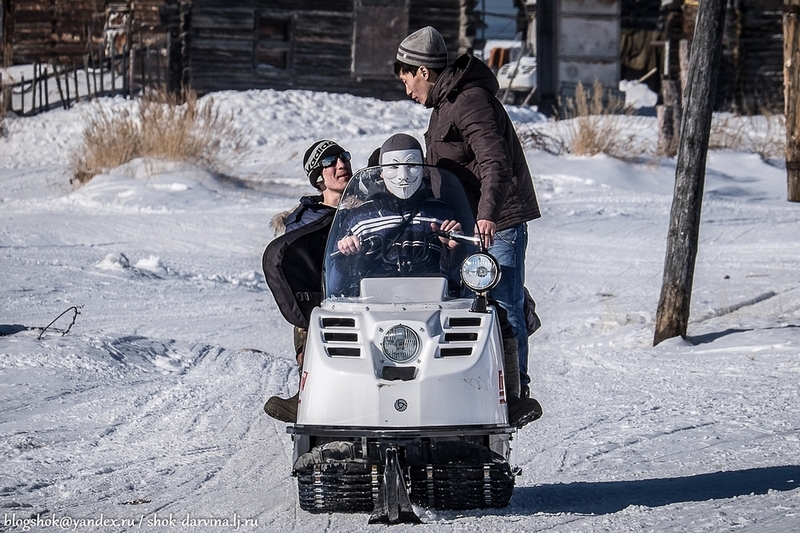 All remaining months last under the reign of the Snow Queen, so villagers need special vehicles for transportation. Ordinary cars can rarely be seen here, they are replaced by snowmobiles which sometimes form real traffic jams! 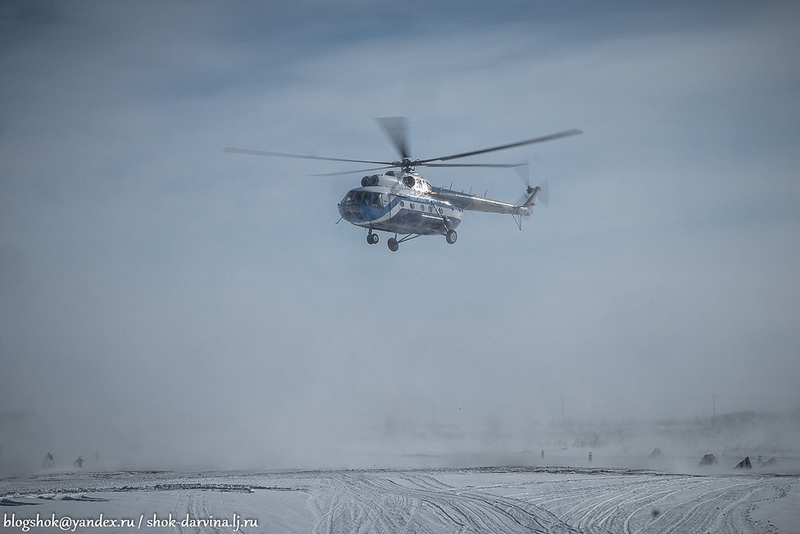 Another important means of transport in Essey is a helicopter. Life in the village fully depends on flying vehicles: they bring food, post and aid, they replace buses. 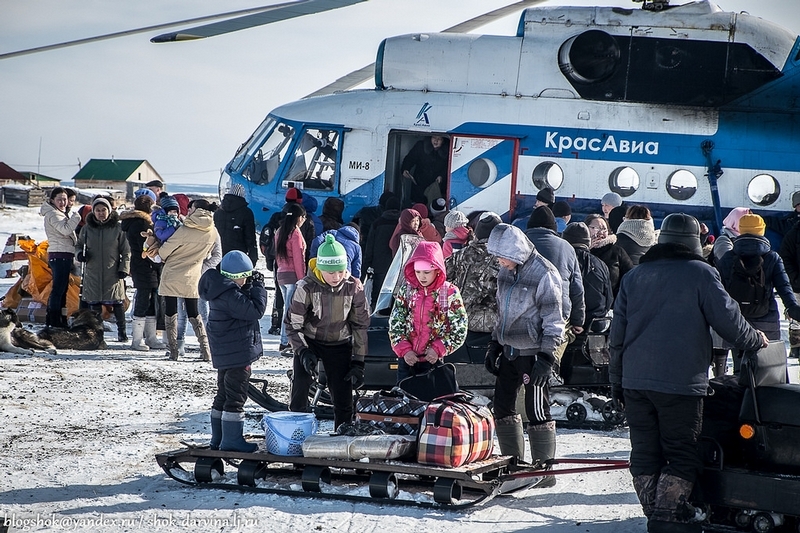 Locals always look forward to meet another helicopter. 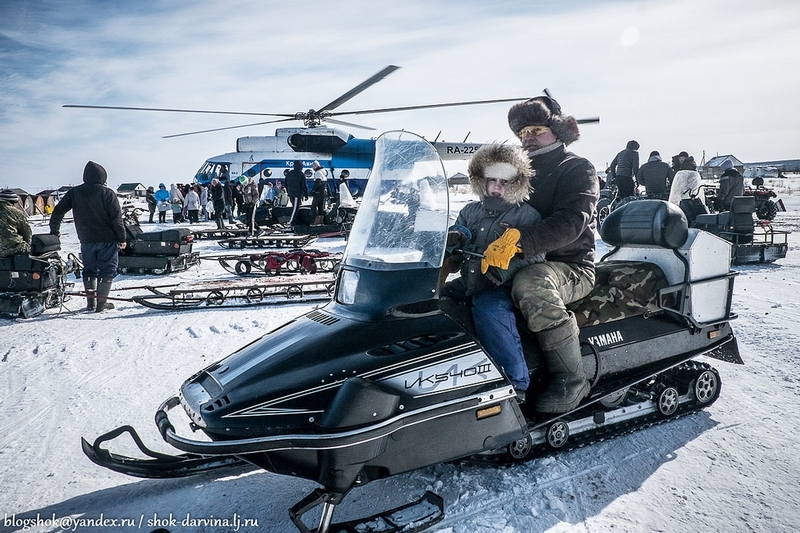 Blogger shok-darvina came to Essey with an environmental project “Evenki reindeer” and was surprised to see such an amazing unknown world. 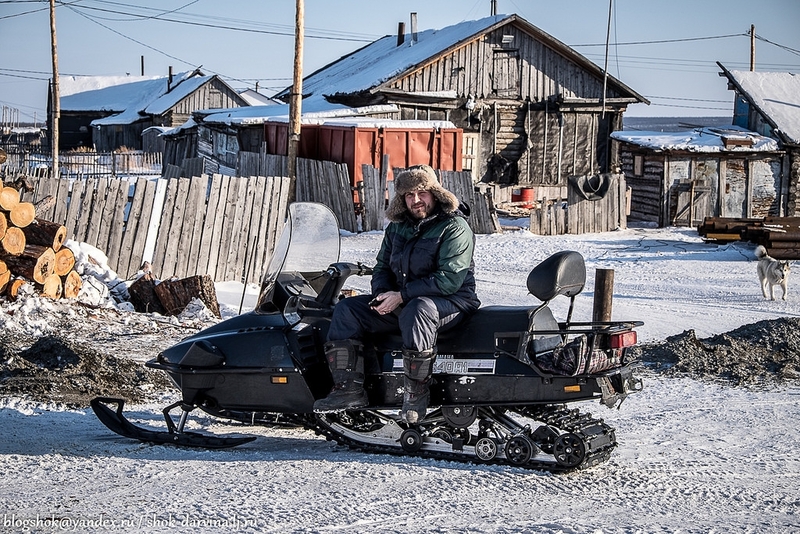 Everything seemed new, including the relations of the locals with their equipment. 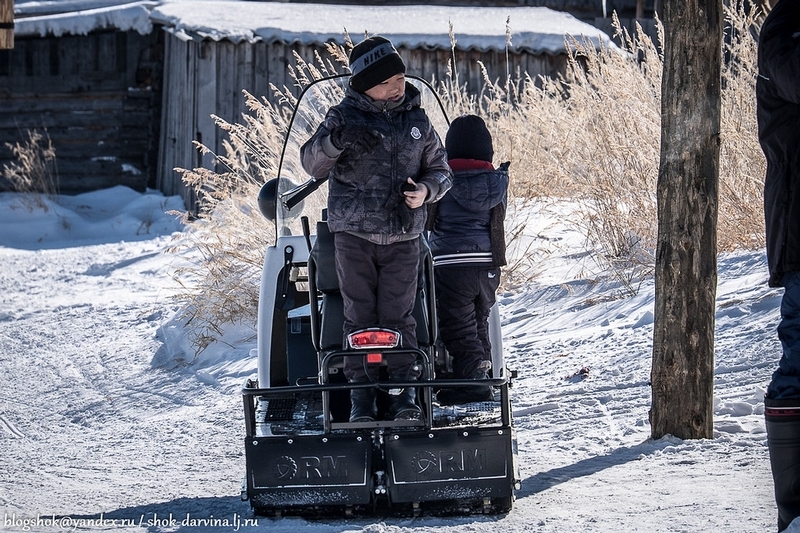 Since the very early years children learn to deal with tracked vehicles. 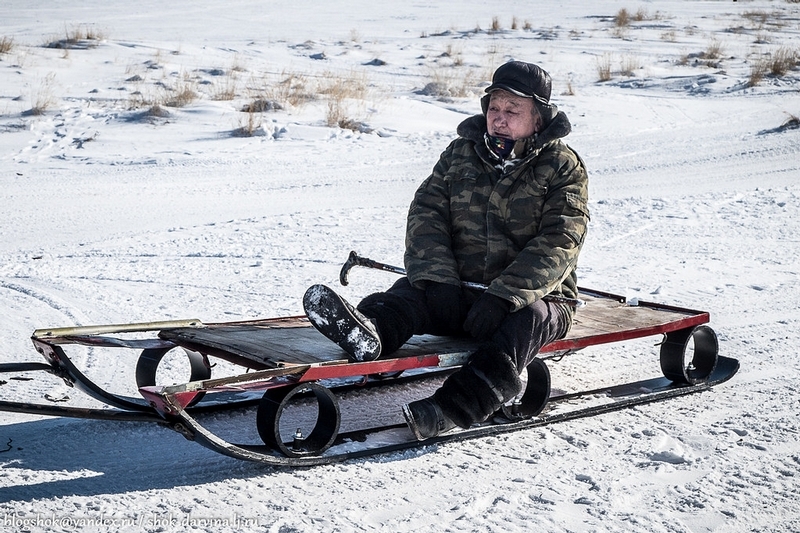 For them it feels like sitting in a home armchair. 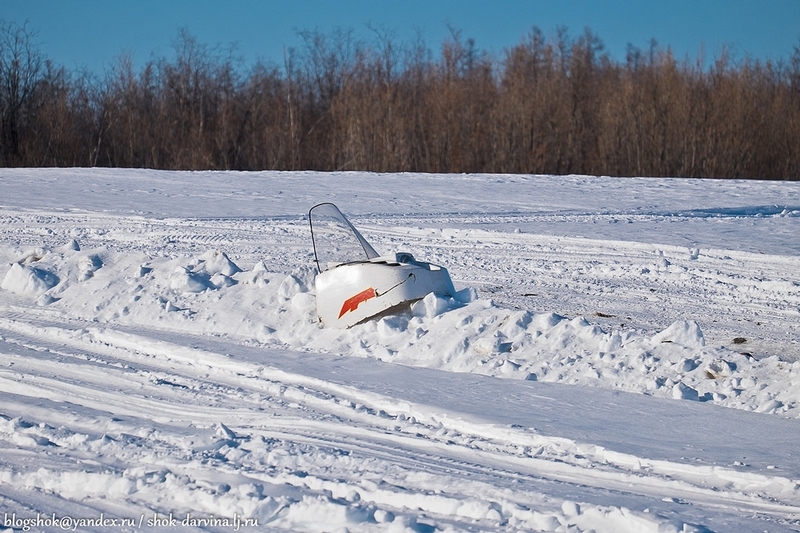 Snowmobile is like a member of a family, as a horse or a reindeer once was. 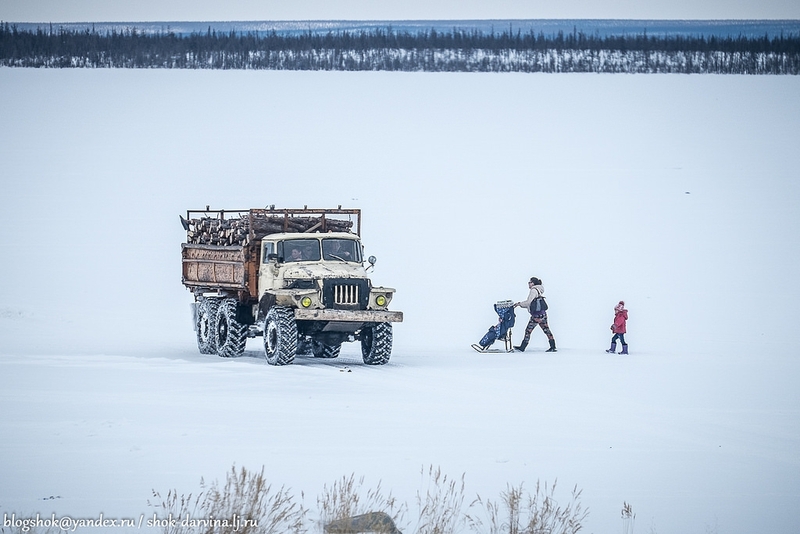 They are used as cargo vehicles, for example, for carrying logs. And they help to bring water home. 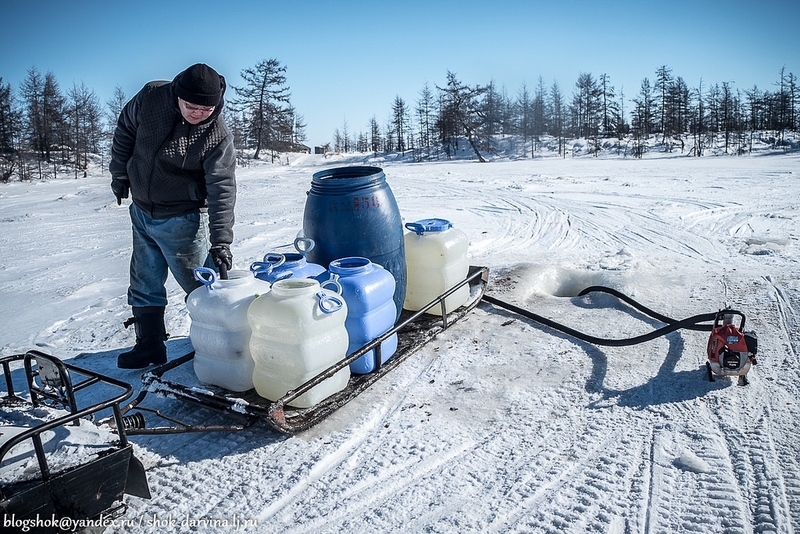 Not to splash water on the way, they prefer to carry ice that can be melted at home. 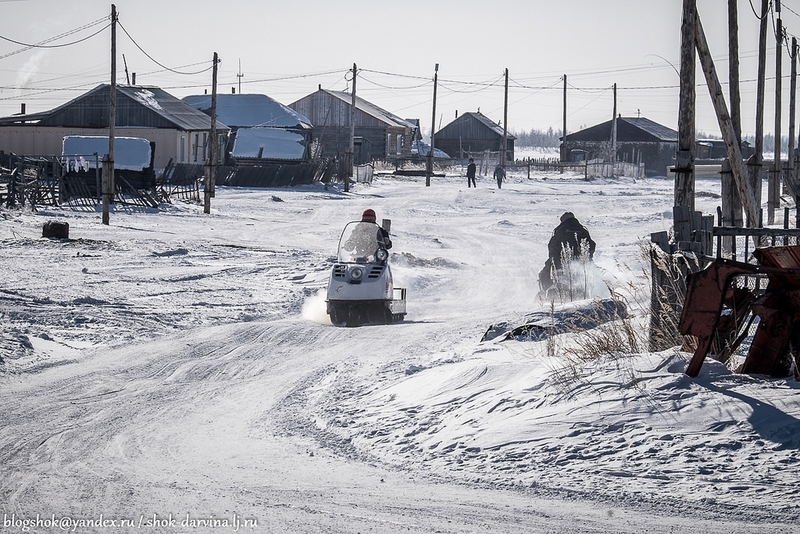 Snowmobiles also bring post to the village. Snowmobiles are used to go to a shop. 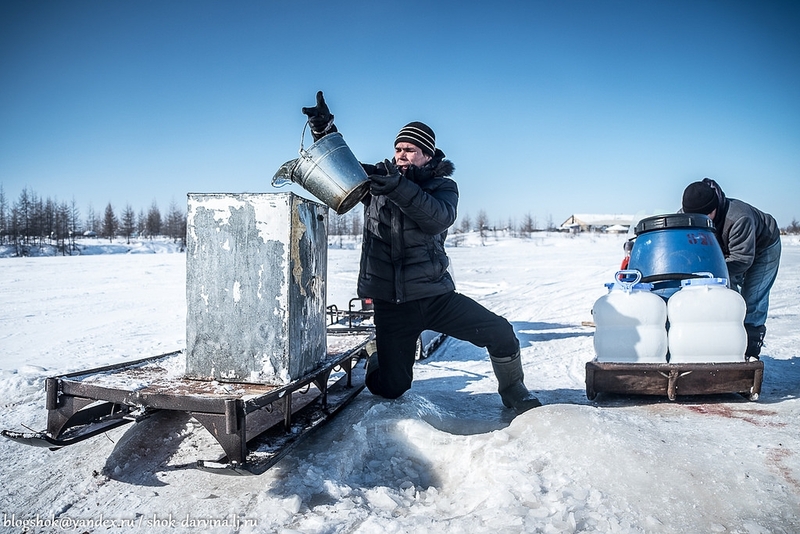 The nose cone is demounted to prevent the vehicle from overheating when it’s “hot” outside (warmer than 15C). 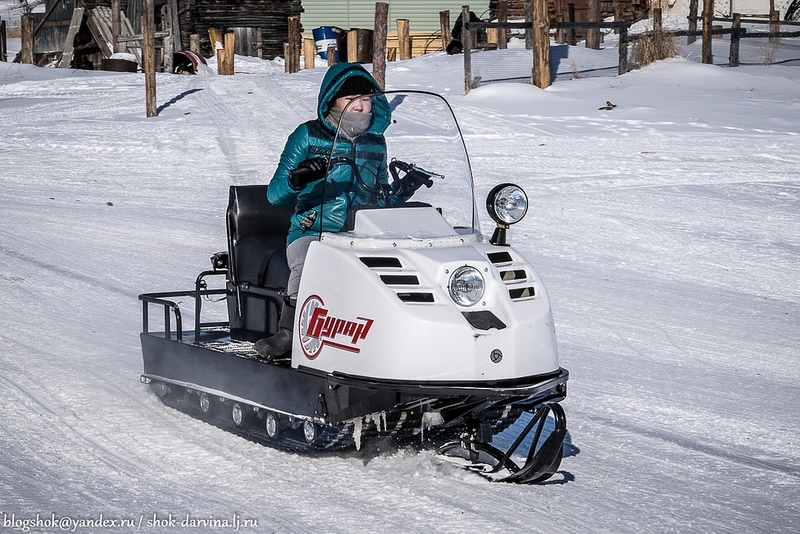 Snowmobiles may comfortably transport elderly people. 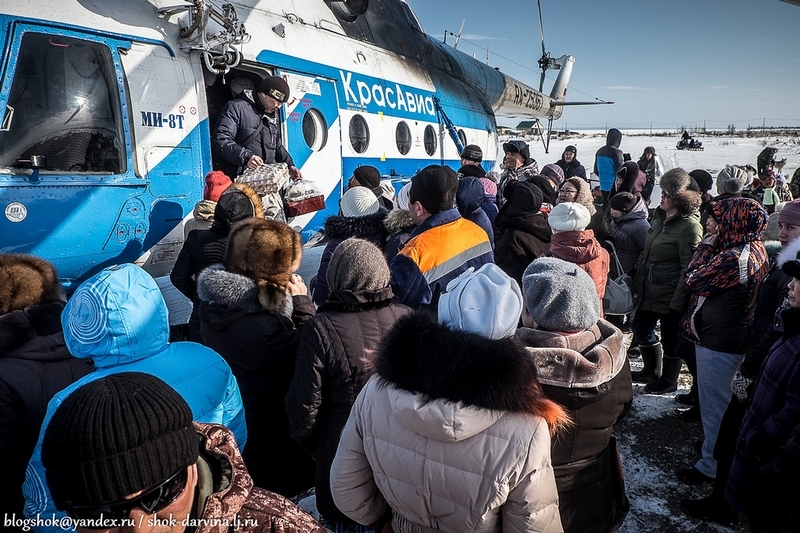 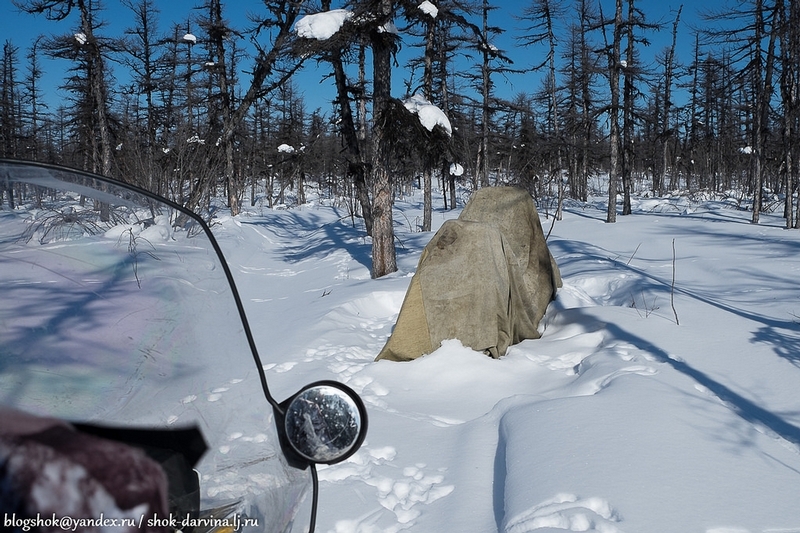 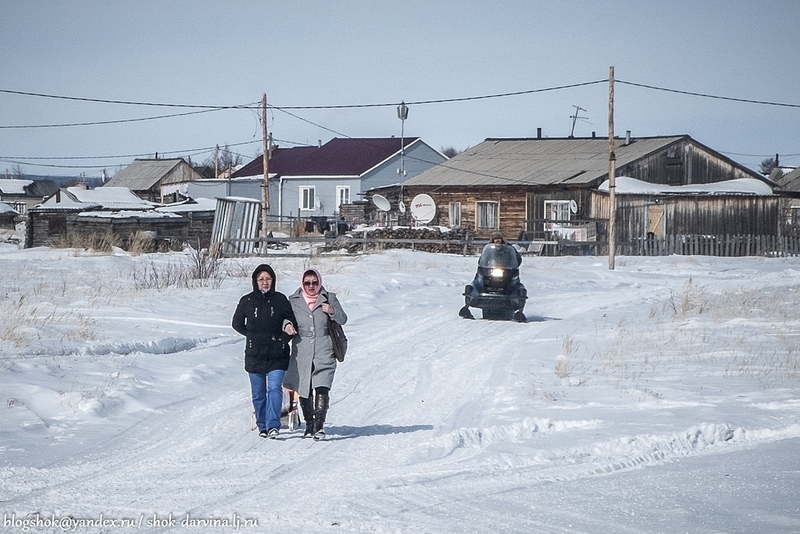 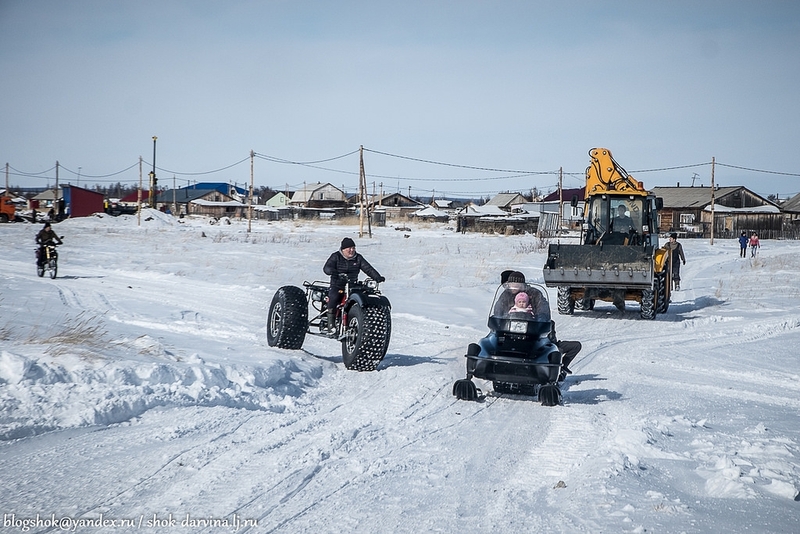 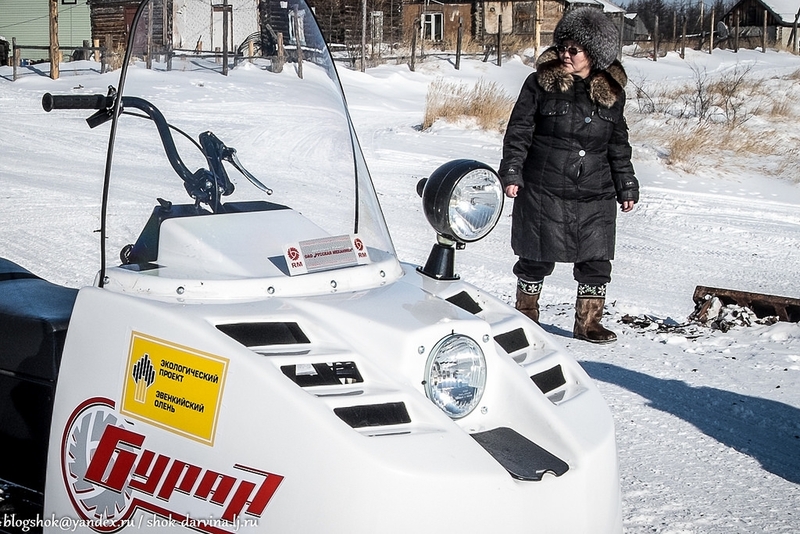 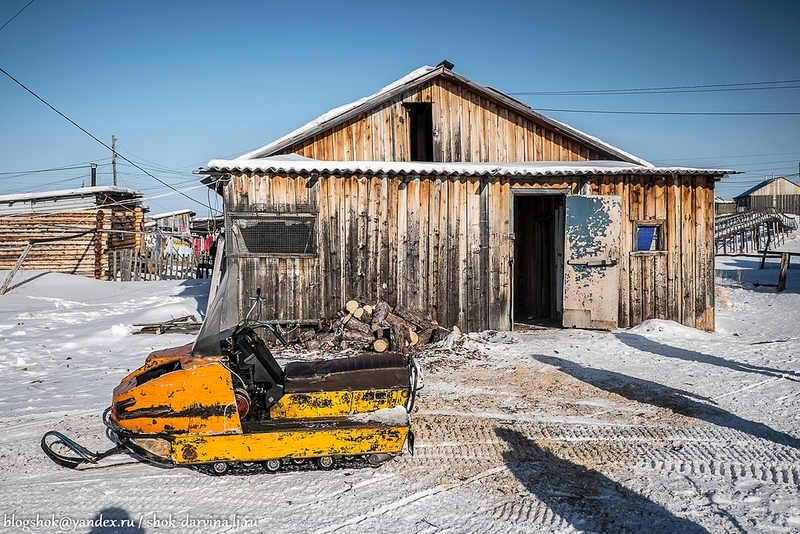 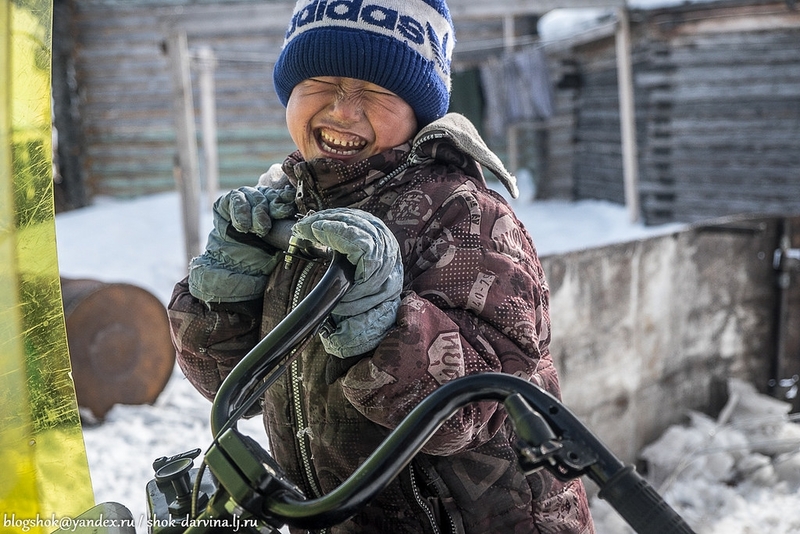 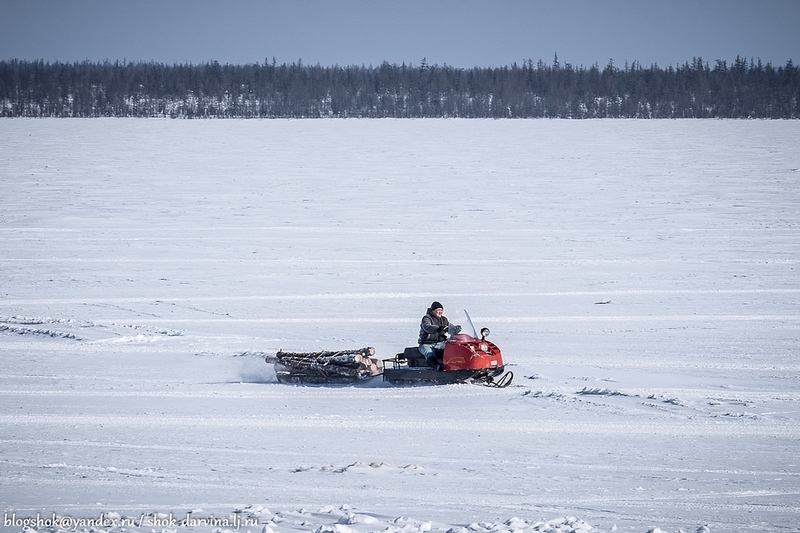 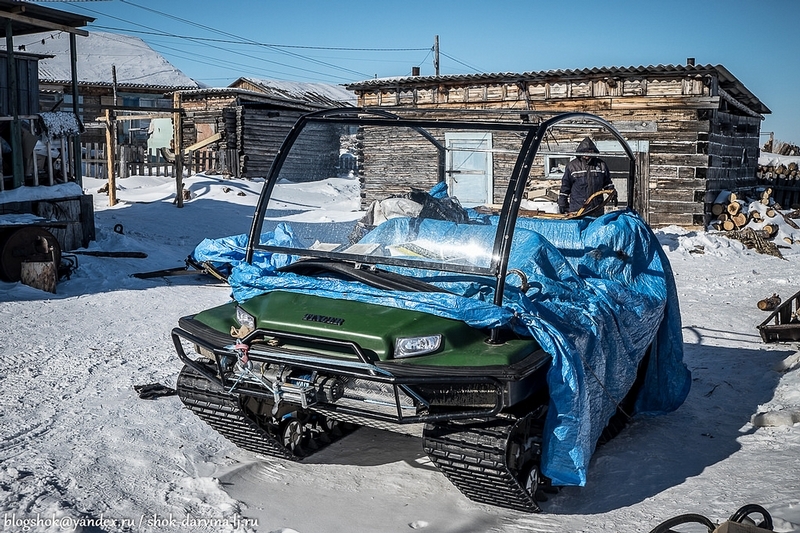 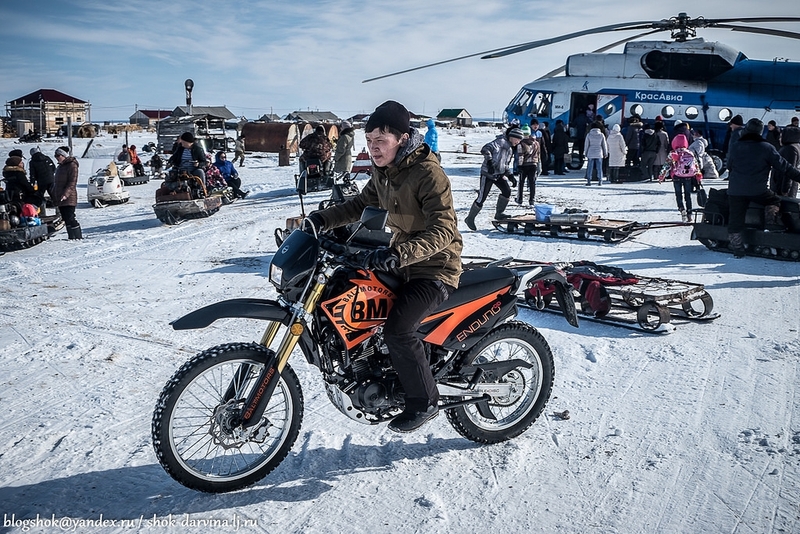 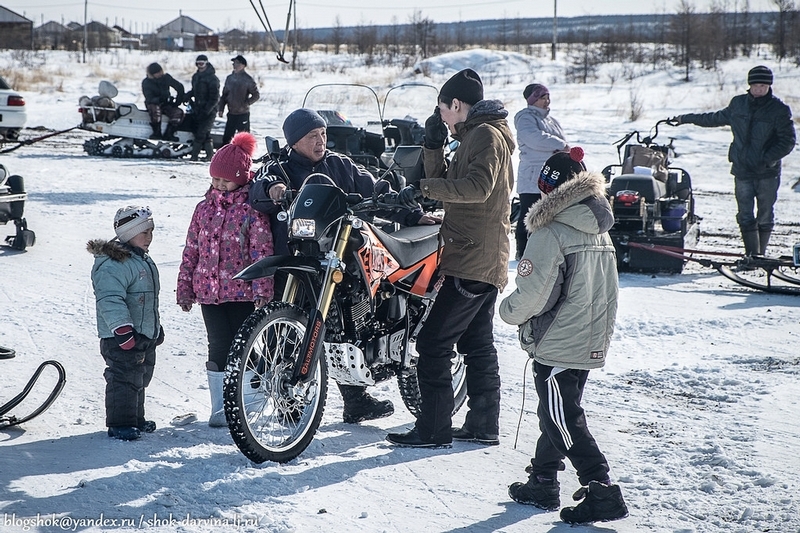 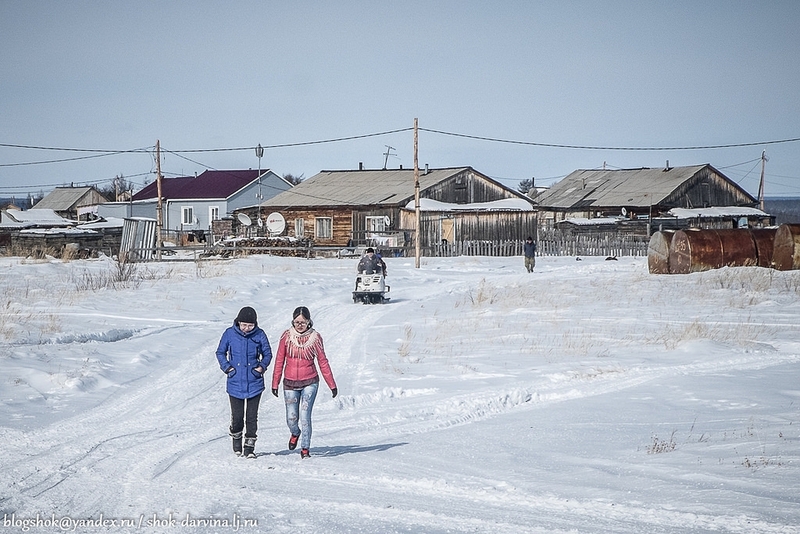 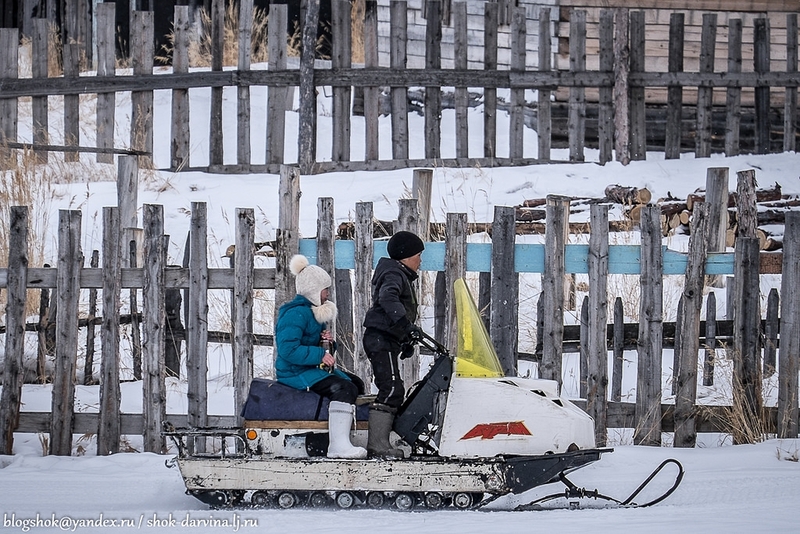 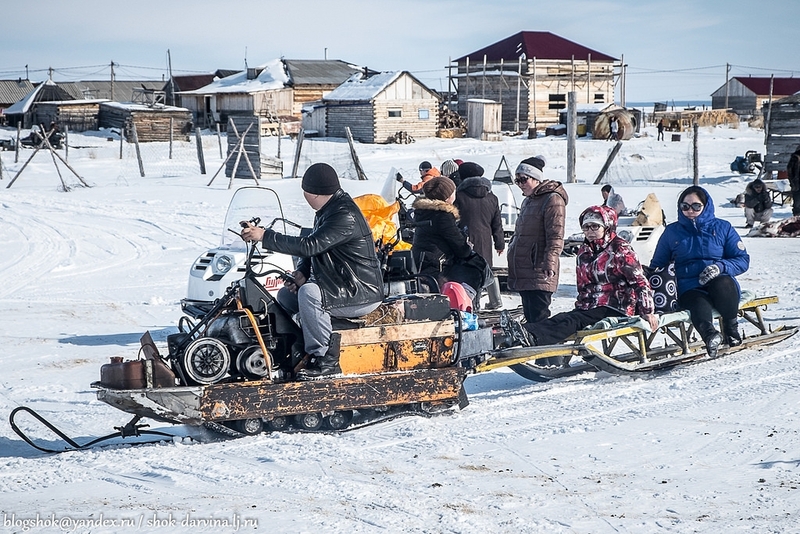 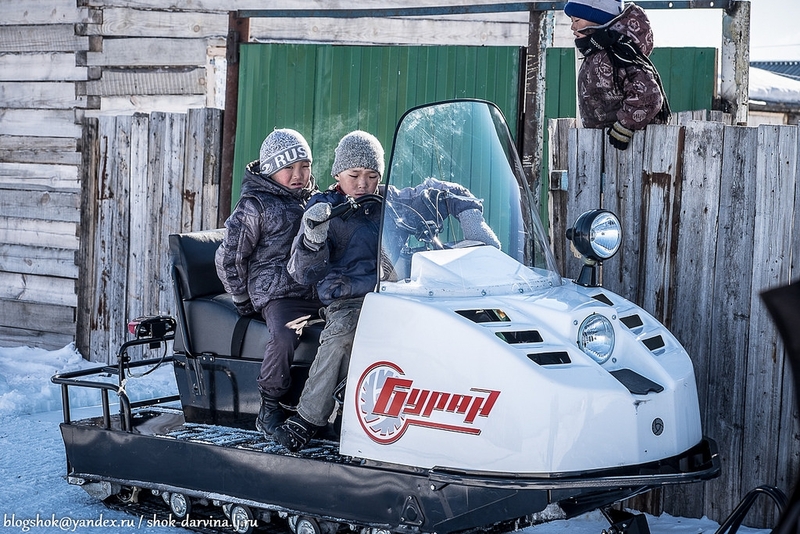 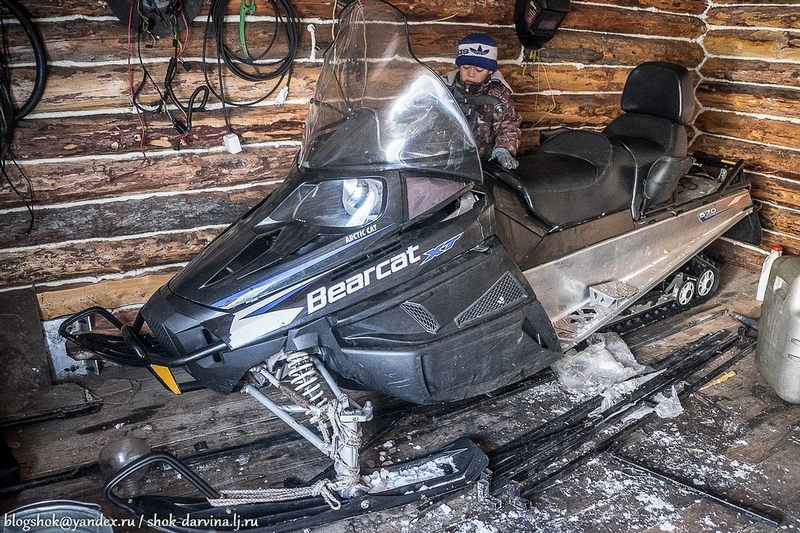 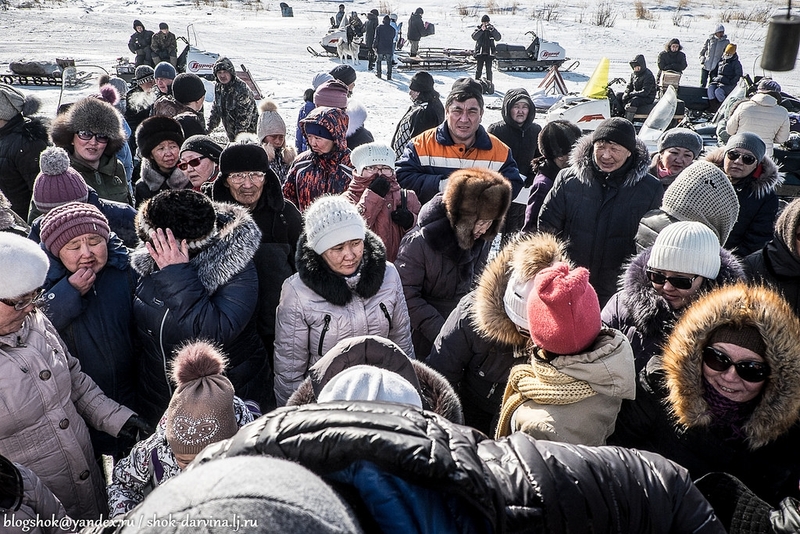 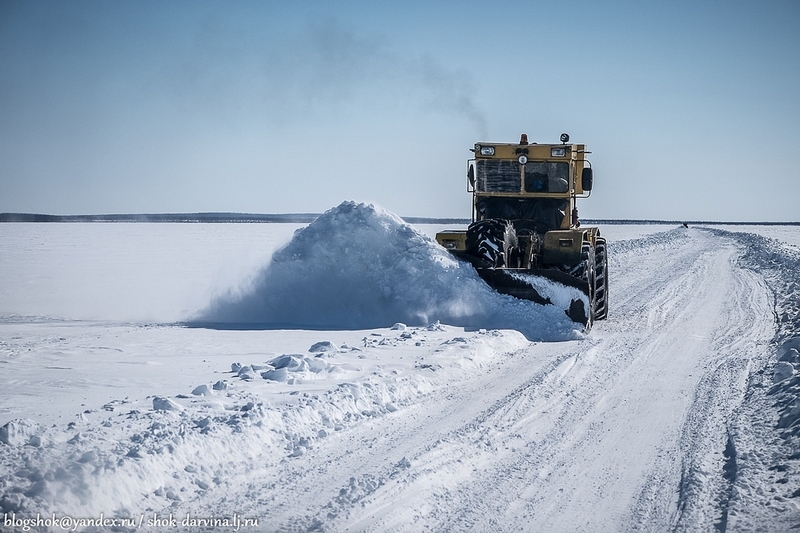 Yakuts of Essey, as indigenous people of the north, should obtain snowmobiles “Buran” from the state for free, but the number of those who need them is always higher than the amount of available snowmobiles. 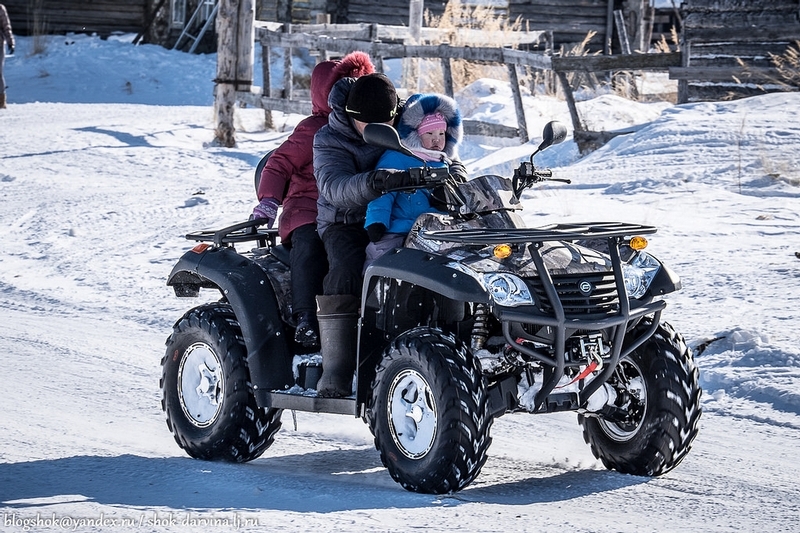 Foreign vehicles are bought at their own account. 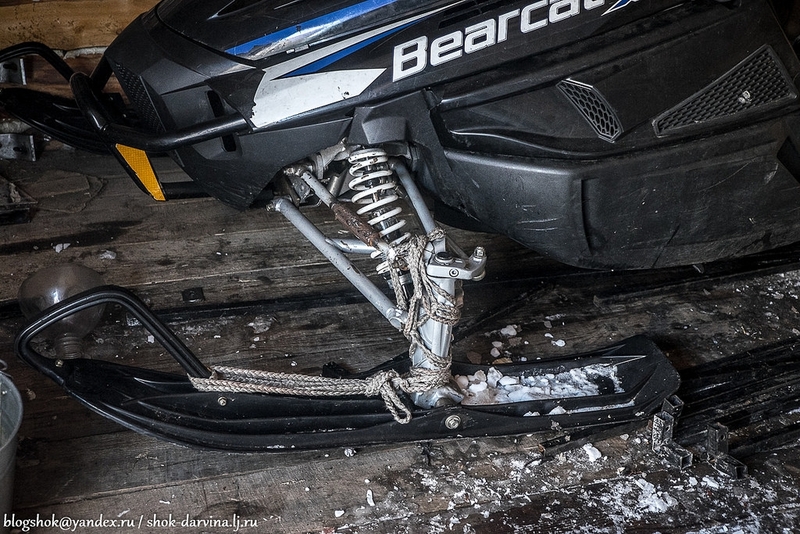 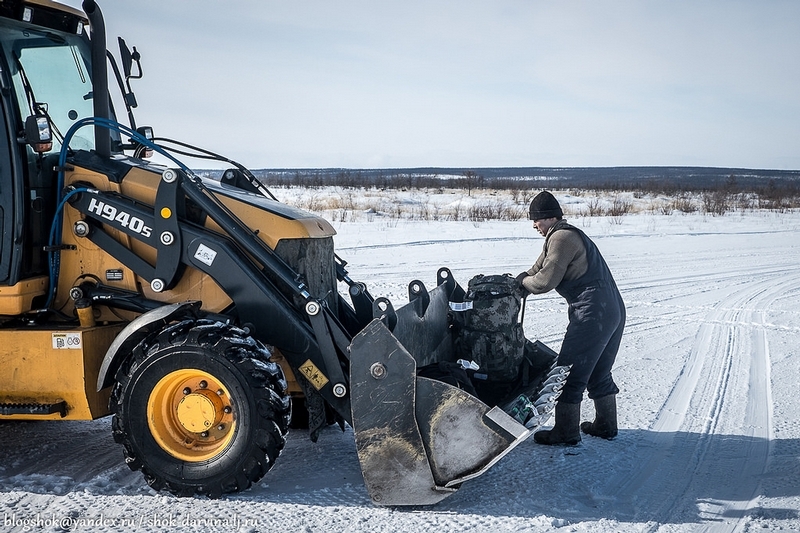 The average service life of a snowmobile is 7-8 years, but here, being actively used, they serve 2-3 years only. 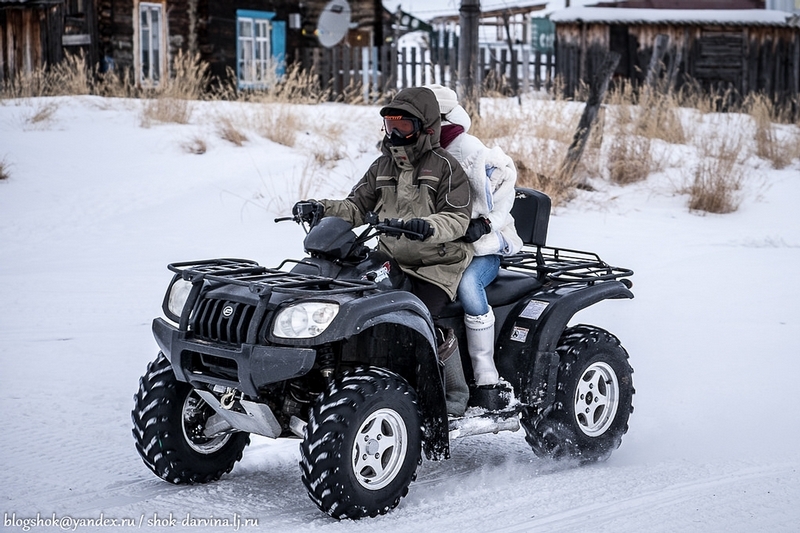 They know what advantages this or that snowmobile has, which one is better to buy and easier to maintain. Any manufacturer of snowmobiles should send its engineers to Essey to modify their vehicles and make them more comfortable and reliable. Other vehicles are more for experiments than for everyday use. 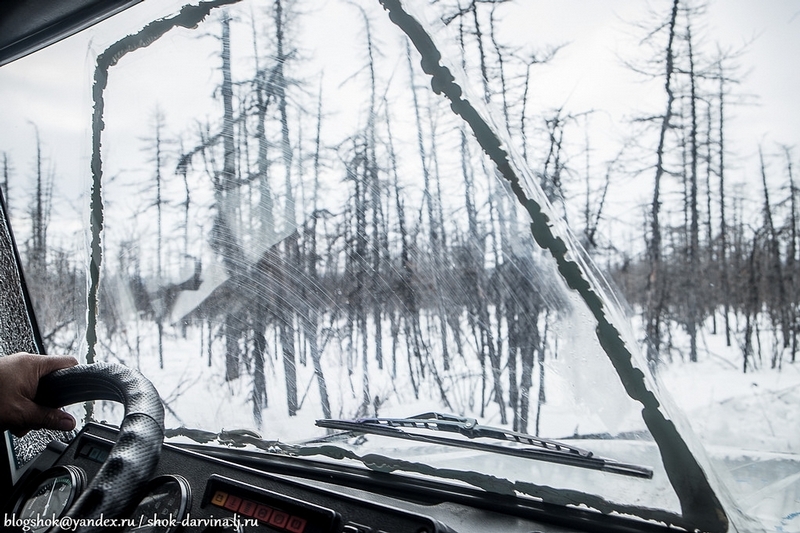 They have to use the second set of glass to withstand the cold. If anyone needs medical aid or a surgery only a helicopter may help. It will bring the patient to Tura that is 600 km away from Essey (2 hours flight). 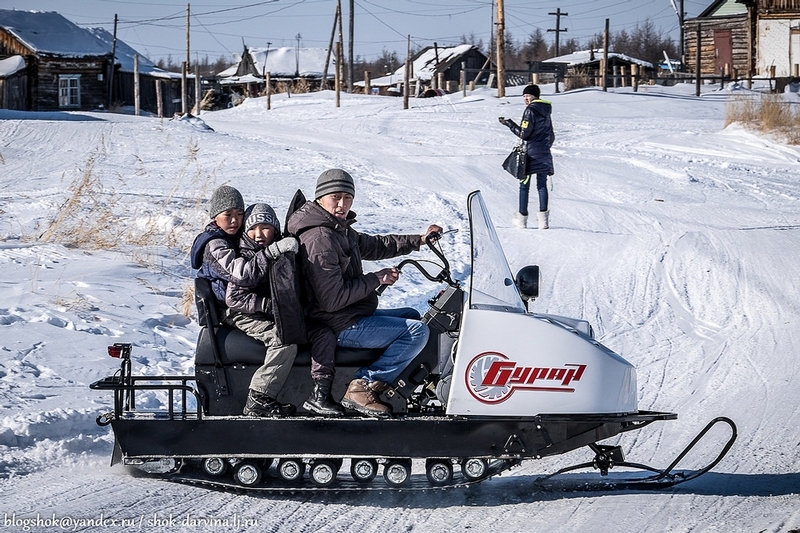 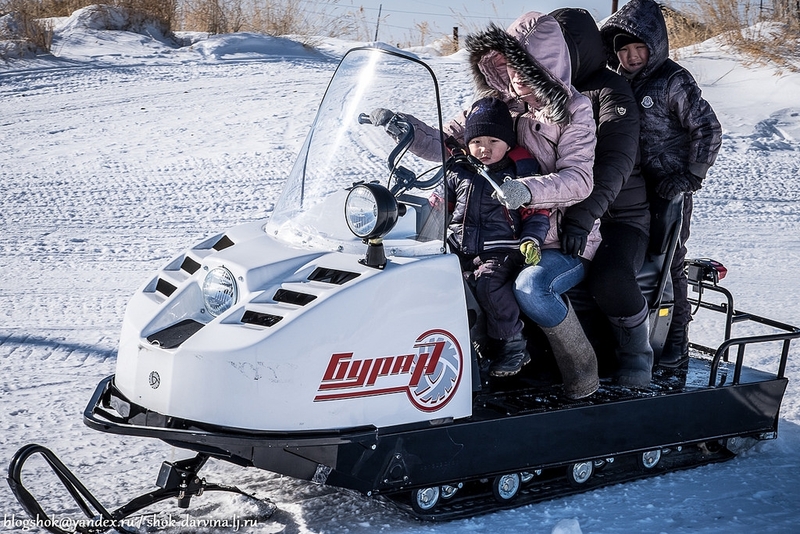 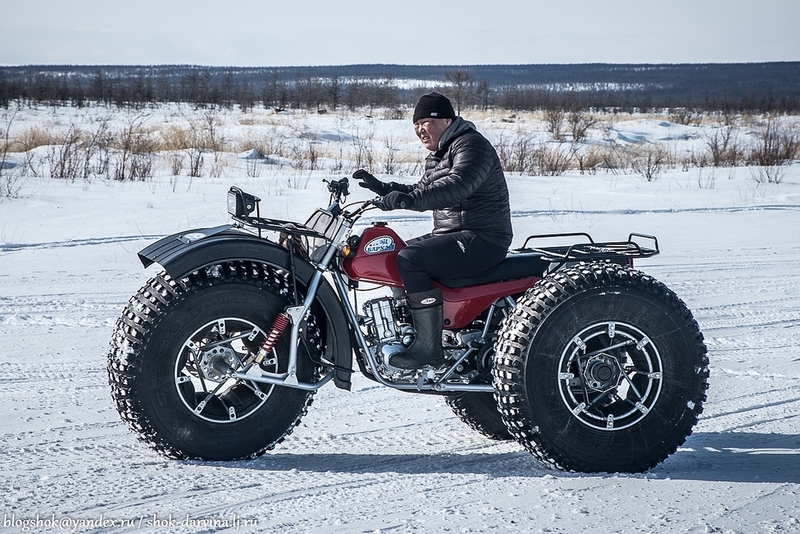 Such sledges cost 500 USD being produced in Krasnoyarsk. 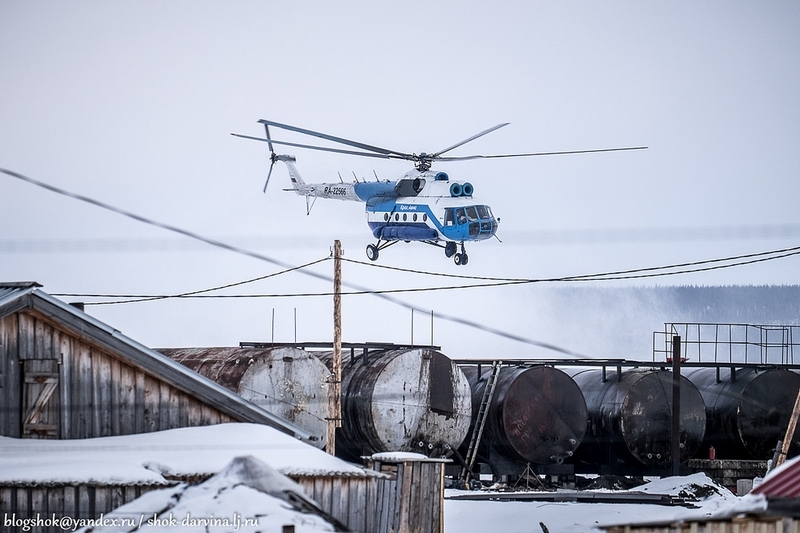 One of the favorite foods here are eggs, as they have no chickens here, helicopters bring many of them from the big land. 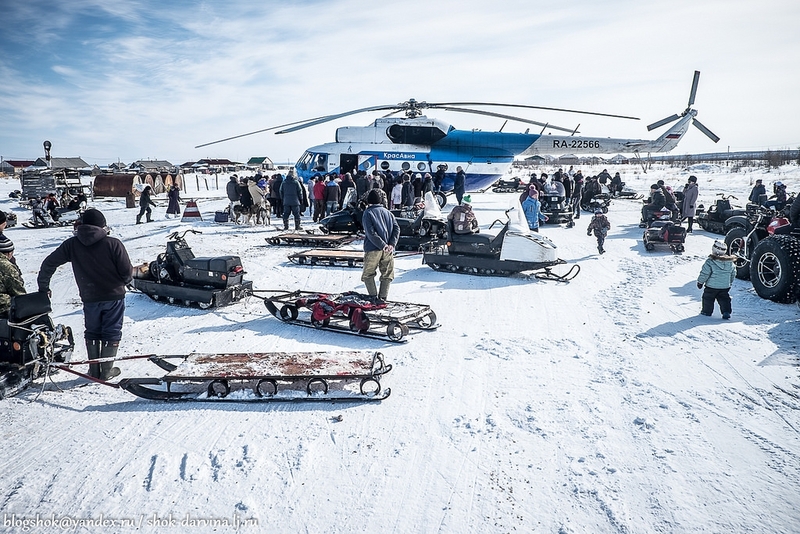 People heading to the airfield. 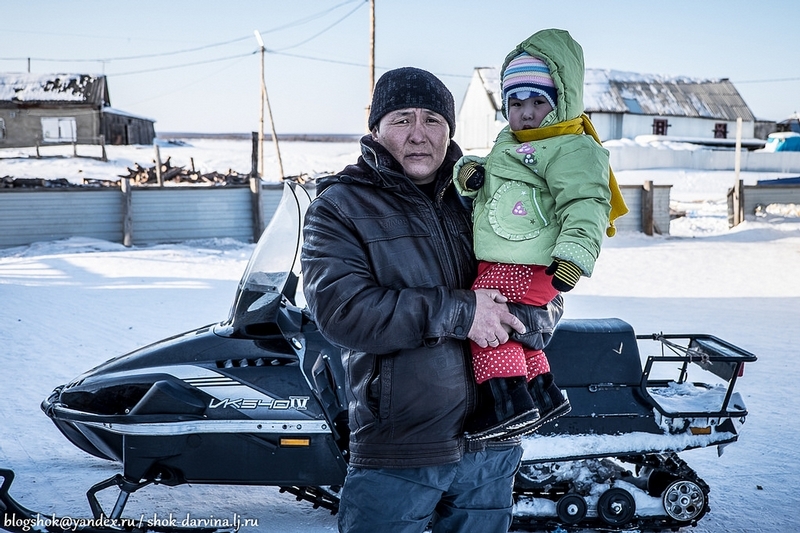 Alexey and his son Misha don’t wait for anyone to come, they are here to see something new, look at their neighbors. 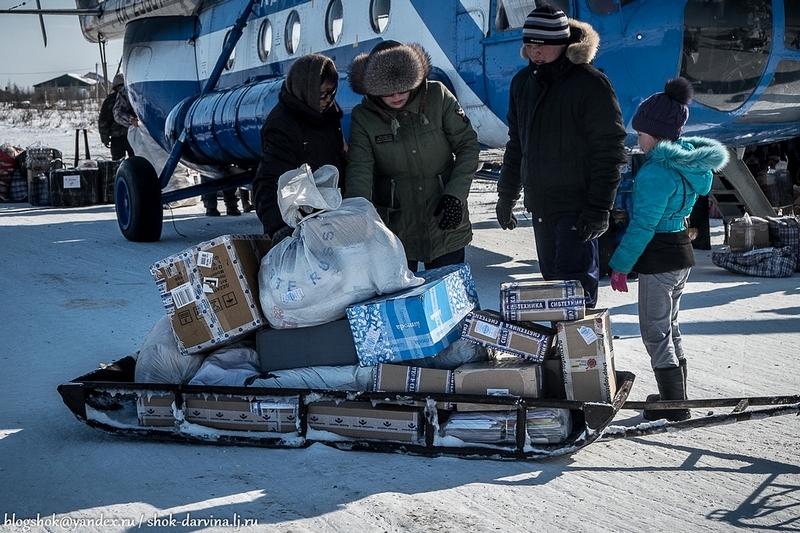 They have got their loads and met relatives and friends, so they may return home now. 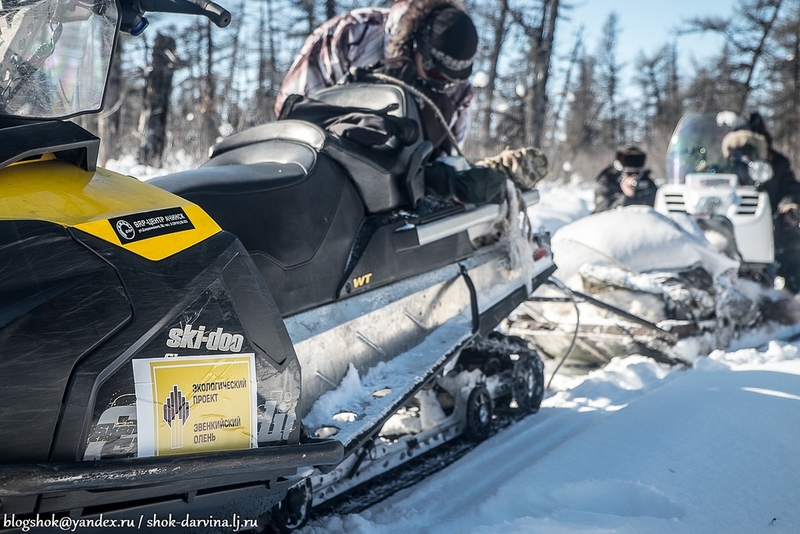 Thanks to shok-darvina for the pictures! 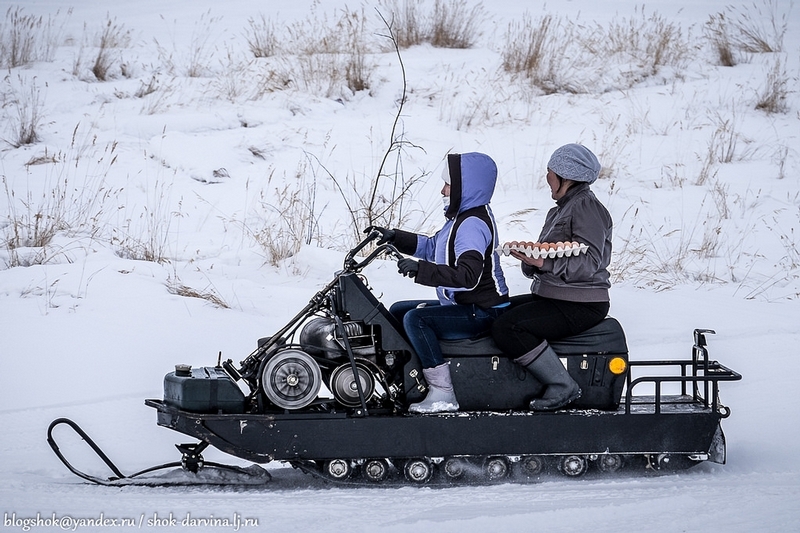 uf… sorry, but this is not life, at least in my eyes. 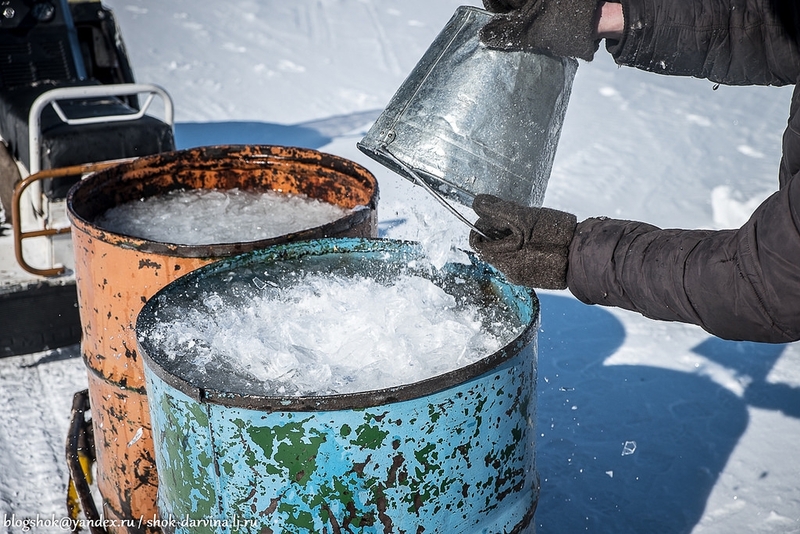 This must be horrible, there is not even a tap water? What’s up with the retard in Guy Fawkes mask ? Evenki – nomadic people. 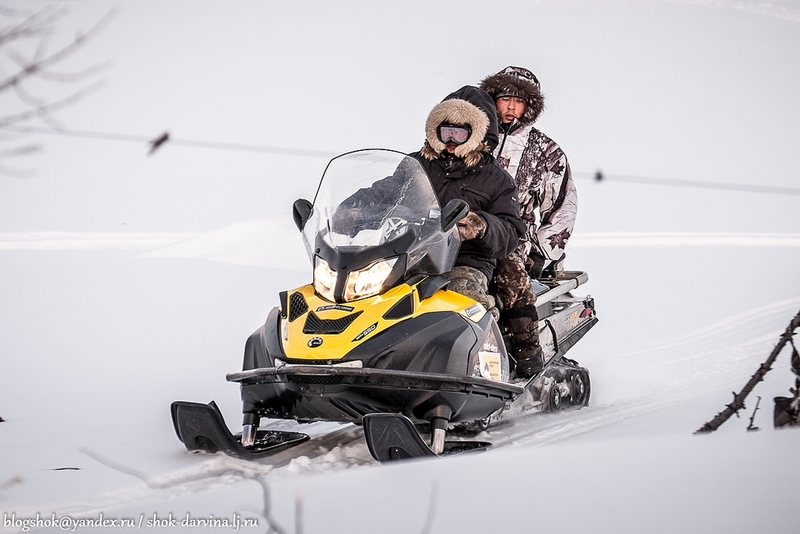 Most of the year they are engaged in reindeer herding, fishing and hunting. Many have an apartment in town, but they like to live in special tents made of animal skins (chum). In the city there is no opportunity to engage in reindeer. 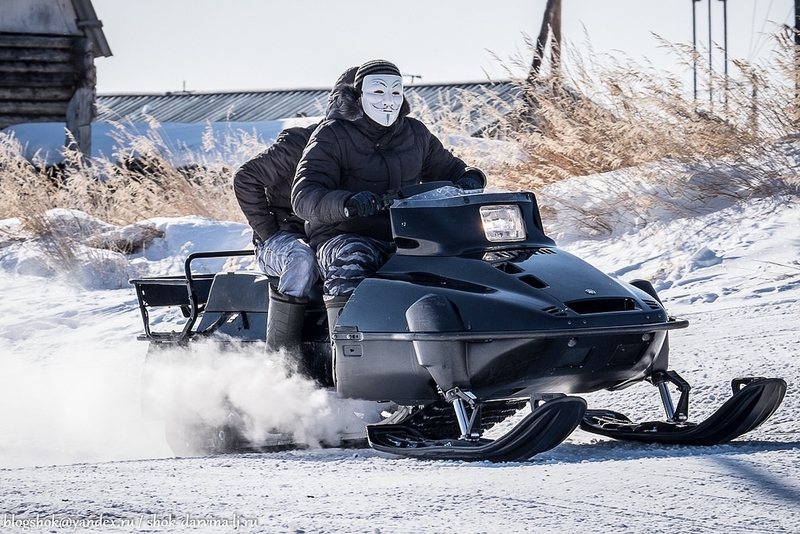 Wow so you buy a snowmobile and it comes with a Guy Fawkes mask… awesome.